Hello, peeps! Welcome back to my Campaigns With Christmas series! Today, the virtue we'll be looking into is a very special virtue: creativity. Of course I know what creativity is, but it doesn't hurt to fetch the exact definition of the word "creativity" from Google: the use of the imagination or original ideas, especially in the production of an artistic work. Right, right, my story might be quite funny, but it doesn't change anything for you guys. Other than my bowl flipping technique of course, but that's besides the point. What does change you guys is the way you live in Blogville. You might not live in my house, but we exist in the same community of pets and their people. As a candy date, I can also find ways to be creative that don't involve flipping bowls over or doing some adorable puppy dog eye stunt for the last piece of bacon. It involves thinking outside the box to solve problems and have fun with an amazing community of doggies, kitties, and everything in between. Creativity could mean hosting some sort of crazy and zany event. It could mean finding an out-of-the-box way to help a friend...spread the word about something...solve a problem...make friends. 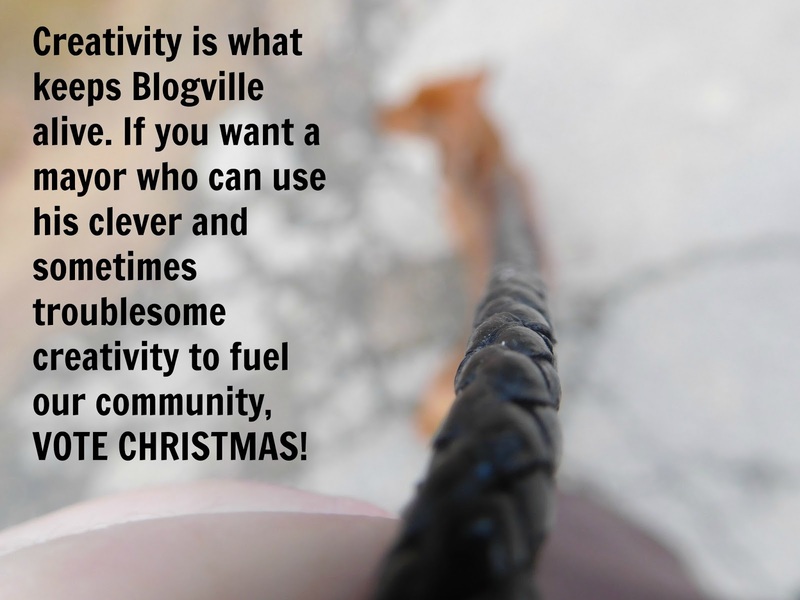 Without creativity, Blogville wouldn't exist. After all, the peeps are using creativity when they dress me up in ridiculous tube steak costumes. Of course we all know love is the most impawtent thing that fuels Blogville, but without creativity, Blogville would be...I'll just say it: blah. But, because creativity exists, Blogville is an exciting, hilarious, loving, crazy, real place. Not only am I glad to be a part of it, but I'm also glad I can help the future of Blogville by running for mayor. Chris Dachshunds are very creative in they play as well as life. I luffs a but of 'creativity' especially when it comes to creatively extracting treats from the peeps! We love how creative you are, Christmas...almost like an engineer!! I agree that creativity is impawtant.